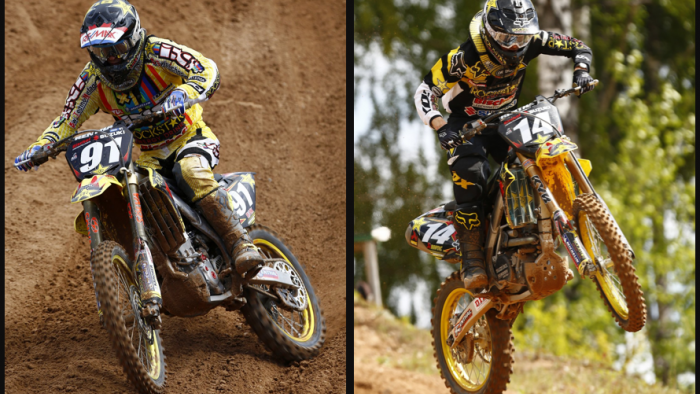 Team Suzuki Press Office - July 7. Jeremy Seewer took his Suzuki RM-Z250 to victory today for the Grand Prix of Latvia at the impressive Kegums circuit, east of Riga, at the fourth round and the mid-point of the European EMX250 series. The Latvian spectacle - attended by 22,000 spectators - was the 11th stop on the FIM Motocross World Championship schedule, but for the Rockstar Energy Suzuki Europe team it was the Swiss teenager's impressive winning efforts in the GP feeder class that again caught attention. Max Anstie meanwhile picked up 13 points for 16th position overall. Kegums was softer and rougher compared to previous years but still with a hard base that unsettled the bikes and meant the fast terrain required precision and resolute concentration. In his single moto on Sunday morning Seewer made a decent top-five start and then haunted the rear wheel of Ceriel Klein Kromhof for the first half of the race. With less than 10 minutes on the clock the Swiss made his move and comfortably used his superior rhythm and 'feel' on the surface to pull clear with a four-second lead. After three consecutive podium results, this was a timely win for '#91' as he beat main title rival Valentin Guillod and snipped away three points from his fellow countryman's advantage in the standings, which now only lies at 10. In the same outing, Jorge Zaragoza crashed twice and did not reach the chequered flag. In the first MX2 Grand Prix moto Anstie could not get away in the top half of the leaderboard and embarked on another of his customary comeback rides; 11th position being a satisfactory reward from a first-lap position of 20th. In the second sprint the Brit ploughed through a stretch of recently watered terrain that forced him to pit for new goggles and he dropped outside the top 20. By the end of the 35 minute and two-lap distance Anstie had only won back enough ground to place 18th. He is currently ninth in the MX2 standings and can take minor consolation in the fact that Jake Nicholls and Alessandro Lupino also failed to obtain decent results at Kegums. Brian Hsu was unlucky not to be able to participate in what was the third round of eight in the EMX125 championship. The Taiwanese/ German crashed early in practice after clipping a hay bale and hurt his foot as well as suffering a concussion. Hsu has a week to recover until further domestic commitments in Germany and then a semi-home Grand Prix at the Lausitzring at the end of the month. Rockstar Energy Suzuki Europe heads straight on to Finland for the third and last event in the north-east European trek where the Hyvinkään Vauhtipuisto circuit, a short distance from Helsinki, hosts round 12 of the FIM series. Seewer will also be in action again as the EMX250 campaign nudges onto its fifth stop. "I'm really happy to finally win. Valentin has won the first three rounds so it was a big goal to try and beat him and I did it today. My start wasn't that good because a rider next to me crossed my line and we almost crashed together. I managed to come back from eighth to second in just two laps and took my time behind Kromhof. I so happy and excited to see now what the rest of the season will bring." "Not much to say about today and it is a bit of the same story. I'm just struggling at the beginning of races and until we fix that issue then we won't be able to improve these results. The frustrating thing is that we know it can be a lot better; something has to change soon." MX2 Moto1: 1. Jeffrey Herlings (NED, KTM), 39:23.741; 2. Jose Butron (ESP, KTM), +0:40.392; 3. Glenn Coldenhoff (NED, KTM), +0:44.150; 4. Jordi Tixier (FRA, KTM), +0:48.004; 5. Jake Nicholls (GBR, KTM), +0:53.224; 6. Christophe Charlier (FRA, Yamaha), +0:54.812; 7. Romain Febvre (FRA, KTM), +0:55.963; 8. Petar Petrov (BUL, Yamaha), +1:12.712; 9. Alessandro Lupino (ITA, Kawasaki), +1:15.794; 10. Jason Clermont (FRA, Kawasaki), +1:17.022; 11. Max Anstie (GBR, Rockstar Energy Suzuki Europe), +1:20.344. MX2 Moto2: 1. Jeffrey Herlings (NED, KTM), 39:29.424; 2. Jordi Tixier (FRA, KTM), +0:50.418; 3. Jose Butron (ESP, KTM), +0:57.147; 4. Petar Petrov (BUL, Yamaha), +1:03.053; 5. Romain Febvre (FRA, KTM), +1:07.640; 6. Dylan Ferrandis (FRA, Kawasaki), +1:21.923; 7. Dean Ferris (AUS, Yamaha), +1:35.685; 8. Tim Gajser (SLO, KTM), +1:43.567; 9. Pascal Rauchenecker (AUT, KTM), +1:47.383; 10. Stefan Kjer Olsen (DEN, Honda), +1:48.382; 18. Max Anstie (GBR, Rockstar Energy Suzuki Europe), -1 lap(s). MX2 Overall result: 1. Jeffrey Herlings (NED, KTM), 50 points; 2. Jose Butron (ESP, KTM), 42 p.; 3. Jordi Tixier (FRA, KTM), 40 p.; 4. Petar Petrov (BUL, Yamaha), 31 p.; 5. Romain Febvre (FRA, KTM), 30 p.; 6. Dylan Ferrandis (FRA, Kawasaki), 24 p.; 7. Glenn Coldenhoff (NED, KTM), 22 p.; 8. Jake Nicholls (GBR, KTM), 20 p.; 9. Harri Kullas (FIN, KTM), 18 p.; 10. Jason Clermont (FRA, Kawasaki), 18 p. 16. Max Anstie (GBR, Rockstar Energy Suzuki Europe), 13 p.
MX2 World Championship Standings (after 11 of 17 rounds): 1. Jeffrey Herlings (NED, KTM), 542 points; 2. Jordi Tixier (FRA, KTM), 403 p.; 3. Jose Butron (ESP, KTM), 353 p.; 4. Christophe Charlier (FRA, Yamaha), 322 p.; 5. Glenn Coldenhoff (NED, KTM), 304 p.; 6. Dean Ferris (AUS, Yamaha), 273 p.; 7. Jake Nicholls (GBR, KTM), 272 p.; 8. Alessandro Lupino (ITA, Kawasaki), 244 p.; 9. Max Anstie (GBR, Rockstar Energy Suzuki Europe), 228 p.; 10. Petar Petrov (BUL, Yamaha), 196 p.
European EMX250 Standings (after 4 of 8 rounds): 1. Valentin Guillod (SUI, KTM), 97 points; 2. Jeremy Seewer (SUI, Rockstar Energy Suzuki Europe), 87 p.; 3. Damon Graulus (BEL, KTM), 70 p.; 4. Ceriel Klein Kromhof (NED, KTM), 68 p.; 5. Brian Bogers (NED, KTM), 51 p.